What was the patriation, and why were First Nations opposed to it? Before 1982, Canada was a dominion of Britain. At that time, instead of having its own constitution, Canada was governed by the British North America (BNA) Act. The Canadian Constitution fell under British law, which meant that only the British Parliament could change Canadian law. Patriating the Constitution would give Canada authority to amend its own laws and make it functionally a more independent country, and in October of 1980, Prime Minister Pierre Trudeau introduced a resolution to patriate the Constitution. This resolution was developed with no consultation with any Aboriginal organizations, and the proposed constitution made little reference to Aboriginal rights. Many Aboriginal leaders were concerned that the patriation would essentially remove Canada’s responsibility to recognize Aboriginal rights and title. That there was no consultation with First Nations about the patriation. The train, however, was not always met with support. Arthur Manuel, for instance, recalls a bomb threat made against it while in Winnipeg.12 Dr Winona Wheeler, on board as a representative of the UBCIC, recalls that the bomb threat was in fact staged by undercover RCMP officers posing as train employees in order to delay the train and to intimidate the activists.13 The train was stopped in remote, rural Ontario, and the passengers’ belongings were searched. Despite the unsettling hold up, the train continued on to Ontario. Click here to listen to Winona describe the events that day. …[T]he media was picking up on us. A couple days, about three days before the train arrived, Marion Dewar, the mayor of Ottawa came to us and asked us how we were doing and we told her, well, we only had about, we could count the number of billets we’d arranged on our hands, and the food wasn’t coming along too well. We were trying to raise awareness about food. So she says, ‘Well, I think you guys need some help,’ and she just went on air and had a big press release and called on the citizens of Ottawa to respond with their friendship and help, and lo and behold, they did. In 1981, the Constitution Express continued across the Atlantic onto Europe, making this now an international demonstration. The Constitution Express travelled to the Netherlands, Germany, France, Belgium, and then England in order to present the concerns and experiences of Aboriginal peoples across Canada to an international audience. They were met with support, and convinced many politicians and members of the House of Lords (now known as the Supreme Court of the United Kingdom) to support Indigenous rights.16 Subsequently, after months of international attention and pressure from Aboriginal groups across Canada, the Canadian government agreed to specifically recognize Aboriginal rights within the new constitution. By late January 1982, and after extended negotiations with Aboriginal leaders, the federal government agreed to the demands of Aboriginal organizations.17 Section 35 was added to the Canadian Constitution to specifically recognize and affirm Aboriginal and treaty rights. Eventually, Section 37 was also amended, obligating the federal and provincial governments to consult with Aboriginal peoples on any further outstanding issues.18 The obligation to consult lead to discussions over the following year to further develop Section 35—subsections (3) and (4) were added in 1983. For more information on the development of Section 35 and what it means, please read Section 35, the Constitution Act, 1982. The Constitution Express: A Multimedia History (DVD). Produced by Vicki L. George for UBCIC & UBC, 2007. A fantastic online resource that includes further information such as timelines, newspaper articles, UBCIC papers, archived petitions, and video interviews. 1 Manuel, Arthur. Guest lecture, Introduction to First Nations Studies. University of British Columbia, Vancouver, B.C. 24 March 2009. 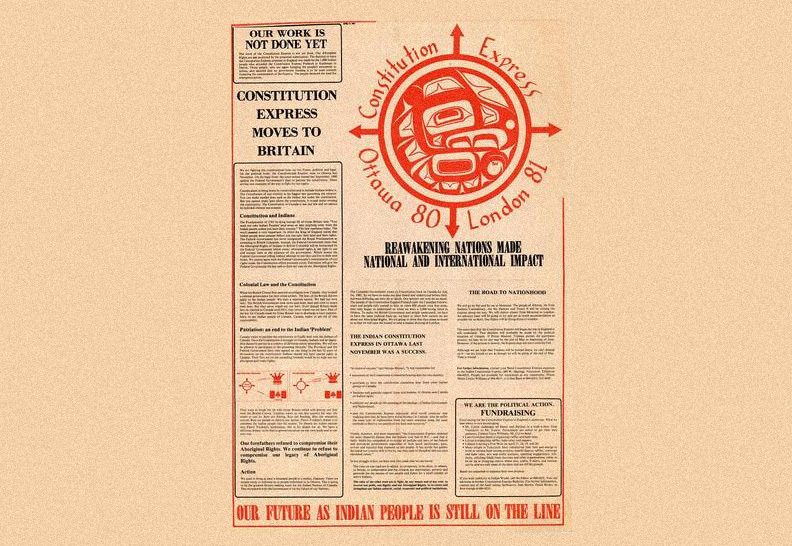 2 UBCIC, Indian Constitution Express. 1981, 7. 10 UBCIC, “Editorial,” UBCIC News. June 1978, 2. 11 George, Vicki. Personal communication; Thursday, June 18, 2009. 13 Interview with Dr Winona Wheeler, The Constitution Express: A Multimedia History. Produced by Vicki L. George for UBCIC & UBC, 2007. 14 Interview with Ron George. The Constitution Express: A Multimedia History. 15 UBCIC, UBCIC Bulletin, Oct 1981. 18 Romanow, Roy J., Howard A. Leeson and John D. Whyte. Canada… Notwithstanding: The making of the Constitution 1976-1982. Toronto: Carswell/Methuen, 1984. 121-2.